There are so many blogs here on Bravester on having a broken heart. I should have named this the Broken Hearts Club. Who knew that part of living a brave life is walking into the vulnerability that allows your heart to get broken. That that is the brave thing. But even more importantly that heartache is a signal to you that you’ve stumbled upon something or someone that makes your heart beat. That this is who you are. A broken heart is always a beginning. Yes, that means pain. Pain is your beginning. We have our beginning so how about a list to help you with the what’s next? I’ve got another one for you. 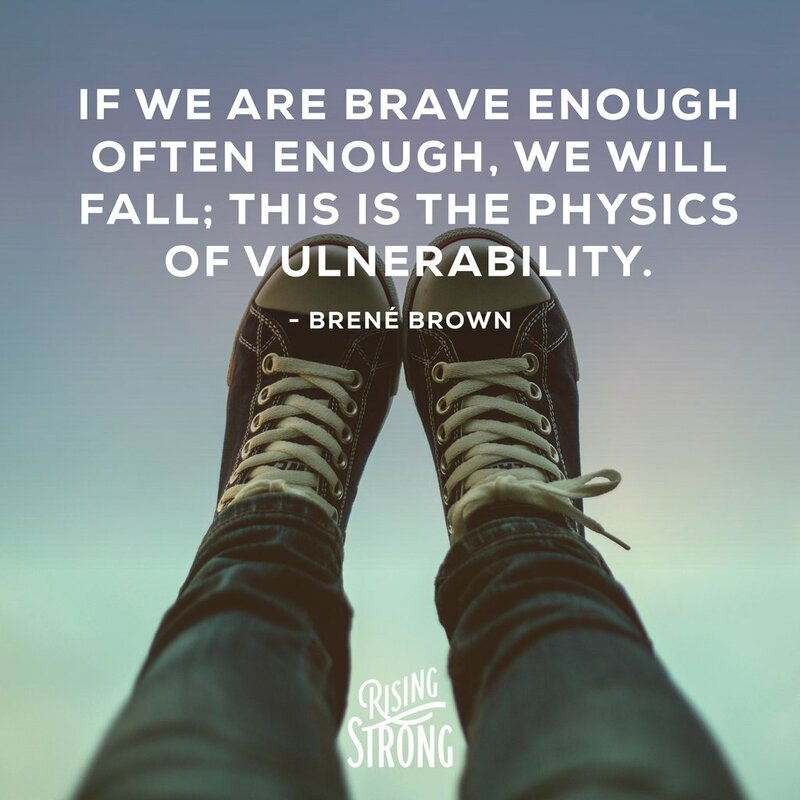 These come directly from Dr. Brene’ Brown in her book Rising Strong. I find them useful and profound and true guidelines to apply to my life. Maybe your life too? Maybe these will help you choose a braver life? Maybe these will help you see the possibility of embracing your vulnerability with bravery instead of numbing it? Note: This list is not my wisdom. It belongs to Brene’ Brown. Though I do add some thoughts. You will notice clearly what is mine and what is Dr. Brown’s. 1. If we are brave enough often enough, we will fall; this is the physics of vulnerability. When we commit to showing up and risking falling, we are actually committing to falling. Daring is not saying, ‘I’m willing to risk failure.’ Daring is saying, ‘I know I will eventually fail and I’m still in.’ Fortune may favor the bold, but so does failure. My thought: Dang. We can’t protect ourselves from heartbreak if we are going to live bravely. We are actually committing to falling. No wonder so many people choose safety and numbing. 2. Once we fall in the service of being brave, we can never go back. We can rise up from our failures, screw-ups, and falls, but we can never go back to where we stood before we were brave or before we fell. Courage transforms the emotional structure of our being. This change often brings a deep sense of loss. During the process of rising, we sometimes find ourselves homesick for a place that no longer exists. We want to go back to that moment before we walked into the arena, but there’s nowhere to go back to. What makes this more difficult is that now we have a new level of awareness about what it means to be brave. We can’t fake it anymore. We now know when we’re showing up and when we’re hiding out, when we are living our values and when we are not. Our new awareness can also be invigorating—it can reignite our sense of purpose and remind us of our commitment to wholeheartedness. Straddling the tension that lies between wanting to go back to the moment before we risked and fell and being pulled forward to even greater courage is an inescapable part of rising strong. My thought: I have long called this “holy tension.” It is the discomfort of being stuck in between but knowing that if you can make a brave decision something holy is going to happen. It is the middle part of the stages of transition from William Bridges’ The Transition Model. He calls this stage The Neutral Zone. It is in these moments that bravery defines you—and you can never go back. 3. This journey belongs to no one but you; however, no one successfully goes it alone. My thought: Ahem! Why are you isolating yourself? 4. We’re wired for story. In a culture of scarcity and perfectionism, there’s a surprisingly simple reason we want to own, integrate, and share our stories of struggle. We do this because we feel the most alive when we’re connecting with others and being brave with our stories—it’s in our biology. 5. Creativity embeds knowledge so that it can become practice. We move what we’re learning from our heads to our hearts through our hands. …The Asaro tribe of Indonesia and Papua New Guinea has a beautiful saying: ‘Knowledge is only a rumor until it lives in the muscle.’ What we understand and learn about rising strong is only rumor until we live it and integrate it through some form of creativity so that it becomes part of us. My thought: What is your form of creativity? The brave live their stories and they are told through personal creative means. Whether it is a blog. Or art. Or creating lessons for children’s church. You’ve got that friend whom you admire who finds the time to run a clothes closet for the local homeless ministry. That is creativity. She is using her hands to live her brave story. 6. Rising strong is the same process whether you’re navigating personal or professional struggles. 7. Comparative suffering is a function of fear and scarcity. Falling down, screwing up, and facing hurt often lead to bouts of second-guessing our judgment, our self-trust, and even our worthiness. I am enough can slowly turn into Am I really enough? If there’s one thing I’ve learned over the past decade, it’s that fear and scarcity immediately trigger comparison, and even pain and hurt are not immune to being assessed and ranked. …The opposite of scarcity is not abundance, the opposite of scarcity is simply enough. 8. You can’t engineer an emotional, vulnerable, and courageous process into an easy, one-size-fits-all formula. In fact, I think attempting to sell people an easy fix for pain is the worst kind of snake oil. Rising Strong doesn’t offer a solution or a recipe or step-by-step guidance. It presents a theory—grounded in data—that explains the basic social process men and women experience as they are working to rise after falling. It is a map meant to orient you to the most significant patterns and themes that emerged from the research. In my interviews with others and my own experiences, I’ve seen the process take twenty minutes, and I’ve seen it take twenty years. I’ve seen people get stuck, set up camp, and stay in one place for a decade. While the process does seem to follow a few patterns, it presents no formula or strictly linear approach. It’s a back-and-forth action—an iterative and intuitive process that takes different shapes for different people. There is not always a relationship between effort and outcome in this process. You can’t game it or perfect it so it’s fast and easy. You have to feel your way through most of it. 9. Courage is contagious. Rising strong changes not just you, but also people around you. To bear witness to the human potential for transformation through vulnerability, courage, and tenacity can be either a clarion call for more daring or a painful mirror for those of us stuck in the aftermath of the fall, unwilling or unable to own our stories. 10. Rising strong is a spiritual practice. Getting back on our feet does not require religion, theology, or doctrine. However, without exception, the concept of spirituality emerged from the data as a critical component of resilience and overcoming struggle. Dr. Brene’ Brown, Rising Strong, pp. 3-10. My thought: Why do I continually mention a relationship with God as part of a brave life? Because life is a broken road of faith. It is hard. The physics of vulnerability means you are going to fall. With God you have a chance to know that you are loved—supernaturally loved—therefore you are worthy and valuable and that God is personal with you. You are not alone on this brave and broken road of faith. You are an overcomer. Can anything ever separate us from Christ’s love? Does it mean he no longer loves us if we have trouble or calamity, or are persecuted, or hungry, or destitute, or in danger, or threatened with death? (As the Scriptures say, “For your sake we are killed every day; we are being slaughtered like sheep.”) No, despite all these things, overwhelming victory is ours through Christ, who loved us. Romans 8:35-37. The choice to live bravely sometimes feels like you are being slaughtered but you are not alone. This path is not for you to walk alone. The research says you can’t successfully rise strong alone. Plus you are contagious, people will be drawn to you and will bless you. Plus God defines love as a pursuing force that is not dependent upon your response back. God is going to continue to pursue and love you anyway because He is love. I’ve been reading some (thanks internet?) about this new myth of faith. This myth states that we can arrive at the place where we are no longer vulnerable to wounds because we are so close to Jesus. Sounds like it was made up by someone who fears vulnerability. It does not match the research. It does not match real life. And it does not match Jesus. The closer the people got to Jesus, the more their hearts broke. I think of the women who stayed with Jesus all the way through His crucifixion and death. They could not leave. They were full of pain but they could not leave. They were continually drawn in even though it hurt so much. Even after He was buried they were drawn in. Of course, then they got the shock of their lives to find out what Jesus said was actually true. Some of you are going to read that list and be inspired. You see you—and the possibility of you—throughout that list. Some of you got lost in that list but still desire to live slightly braver. You know that there is something deep inside of you pushing you to live better. Do not fear that holy tension. This brave life is possible for you. Your heart, your soul, your hands are drawn to it.